We are delighted to find a product which promises to reduce work and increase safety in the moving of pianos. These products are drop shipped from the manufacturer, and modifications are possible for an added cost. The steel construction and overbuilt qualities of these products will serve you well. They will also be around for many years, hanging in the garage, to move all sorts of heavy objects. -- A 12 inch lip to make sure of a secure hold at the lower end. -- A handle on the lower lip for control going down stairs. 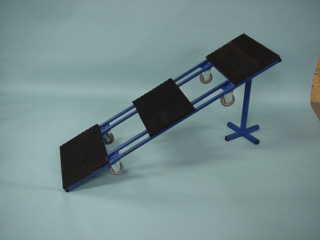 -- Wheels, which are not found on other skid boards, to roll the piano instead of carry it. 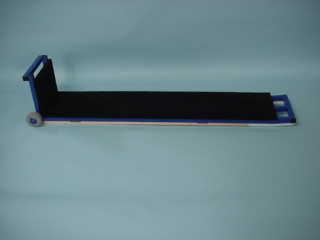 -- Coming soon-- A high impact plastic cover for the skid underside for easy stair use. instead of the end of the skid jamming into the carpet. -- Caution: Web Straps must be used in an "X" pattern for control. 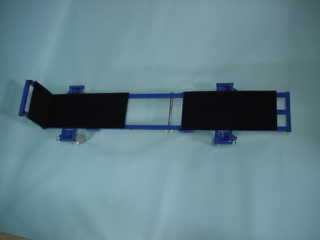 Can be ordered with "E" rails for straps with "E" clips. We offer moving straps with "E" clips. We offer conventional one piece Web Straps. We offer conventionals Web Straps. CAUTION: Web Straps must be used in an "X" pattern for control. What a hot rod! Load the digital piano on this dolly, and the pedals are not hanging there alone. inset so that the overhang at both ends allows for the tilt and turn method of negotiating corners. piano on the dolly permanently. In such a case, ask about the locking wheel option. Web straps are highly recommended with this dolly. on a grand piano this eliminates having friends hold the piano as you remove the leg. Much safer. 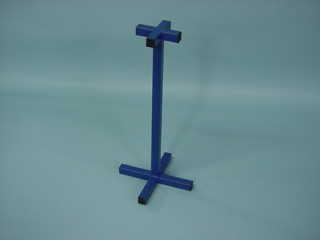 Also very useful where legs are in need of repair, and for replacing casters. CAUTION: Do not use more than one Grand Stand at a time.